Shu Uemura's launched a rather innovative new foundation formula which combines skincare benefits with a weightless liquid-powder texture that lasts and has much higher sebum-absorption capabilities than the average matte foundation. Just for demo's sake, I actually did not use setting powder for the shot above. For someone with dry skin like me, adding powder on top of this velvet-finish foundation looks way too matte for my personal preference. 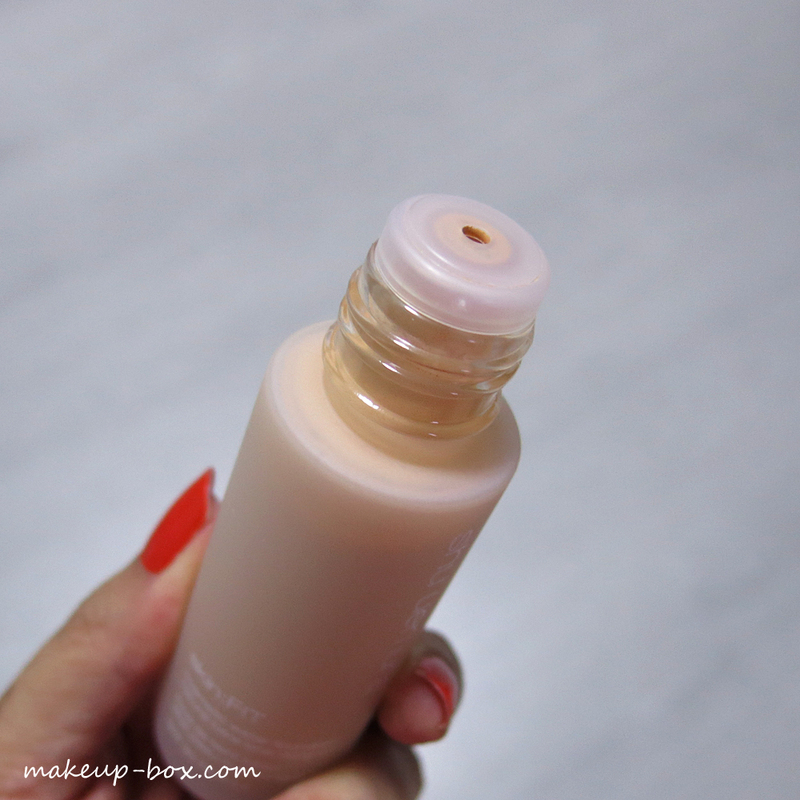 But if you have oily or combination skin, this would probably work better than typical foundations for shine control. If you're interested in a more dewy long-wear foundation that's equally lightweight, check out my post on VDL's Beauty Metal Foundation here. The product has a bi-phase liquid and powder formula which needs to be shaken up before use. 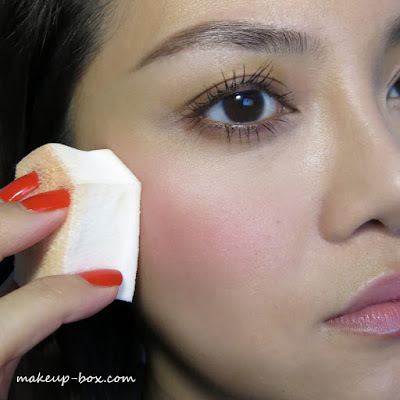 It also comes with a special dual-sided pentagon sponge with a velvety flocked side which is for applying the liquid, and a regular side which you pat over the applied foundation to set the formula (by pressing the pigments into the skin for a more natural-looking "fit" and absorbing excess solvents). This formula references traditional Mizu Oshiroi (water foundation) technique used by maiko today, and that was born during the Edo period of Japan (beginning 17th Century). The liquid is a cosmetic water containing pomegranate extract, a powerful antioxidant, as well as mint to refresh and cool skin in the Summer heat. The powder blend contains a mix of "smart powders" with perlite to absorb and slowly release water to the skin, airlicium which absorbs many times the amount of oil regular absorbent powders do, and also a soft-focus powder to blur pores. The formula also contains water-dispersed organic UV filters and provides SPF30 PA+++. It's important to find out how the formula works because it doesn't feel anything like the usual silicone-y formulas which give you a lot of time to rub and blend. If you imagine calamine lotion, you need to get your skin coated evenly and set the product before it can crease or smear, so make sure you take note of the application steps. Use it right though, and you get a velvety, air-brushed matte finish that's really quite beautiful. Add a couple of drops at the time to the back of your hand and use the flocked "furry" surface of the sponge to pick up the product. Work in sections. This is not the type of foundation you dab all over your face and take your time to blend. Apply to one section/area of the face in a mix of pressing and smoothing motions. Once you get an even application, flip the sponge around and use the regular side to pat pat pat. This patting absorbs excess liquid solvents quickly and helps set the foundation before anything smears or creases. Then move on to the next section of your face and repeat. 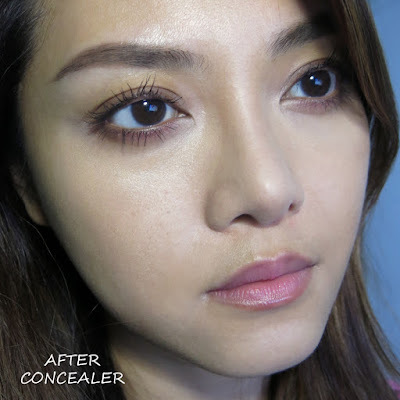 If you want an ultra-matte look, you can finish with powder but I have dry skin and did not want to over-mattify or dry out my face so I skipped. Lasting power was pretty good on me when I was in and out of the hot humid tropical weather this afternoon. The strange thing though, is that while this is very long-wearing while dry, you need to be careful when it is wet. Remember this is a water-activated formula, and if you're sweating or you jump in water, rubbing your face can smear off the coverage. This is probably the main flaw I see for the product because if you live in a humid place where you're prone to sweating you need to be careful when wiping off sweat. While I didn't get any streaking and melting in the heat when I wore it, I still recommend pressing off your sweat, and not rubbing while it is moist. If you prefer a less matte finish on some days, just go ahead and use a hydrating/luminizing primer before the foundation. Because this formula contains only water and powders and no other fillers that add bulk and texture, it has the ability to take on some of the appearance of whatever you apply beneath. This is essentially a liquid powder. It dries quite powdery and concealers will grab on top of it. 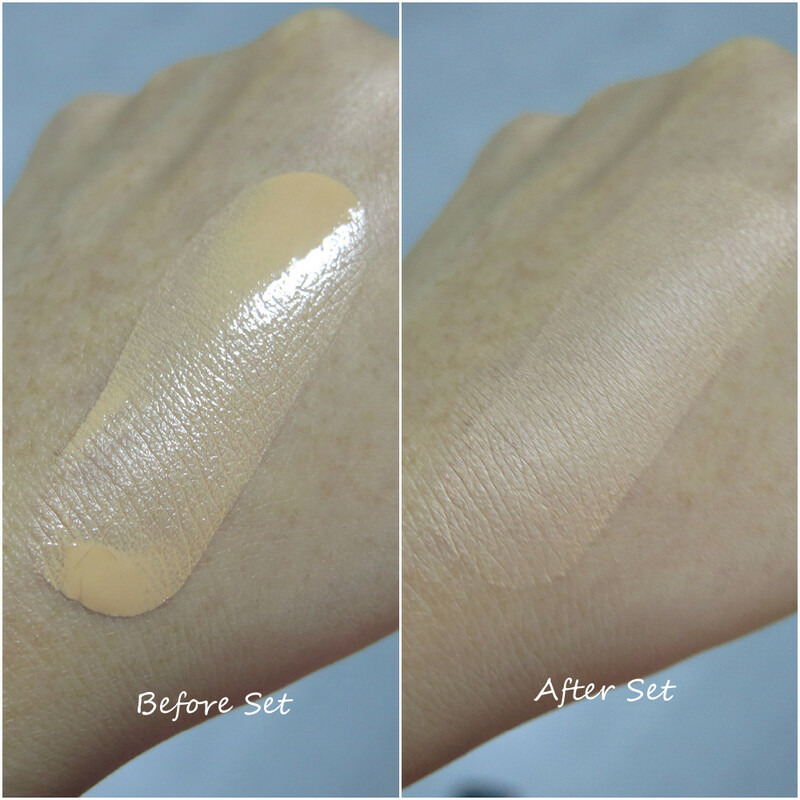 That's good for blemishes, where you want concealer to go on concentrated and not sheer out too much. But it's bad for the eye area. (It's a bit like trying to apply concealer on top of powdered skin.) So my recommendation is to NOT use this around the eyes. You CAN press it on with fingers, but it's quite a bit more time-consuming and takes longer to set than if you used the sponge the way it was designed to be used. Additionally, one extra good point is the sponge is actually pretty easy to clean. It might be because the formula is not oily, silicone-y or waxy. So I was actually able to clean it quite easily with regular foaming face wash. 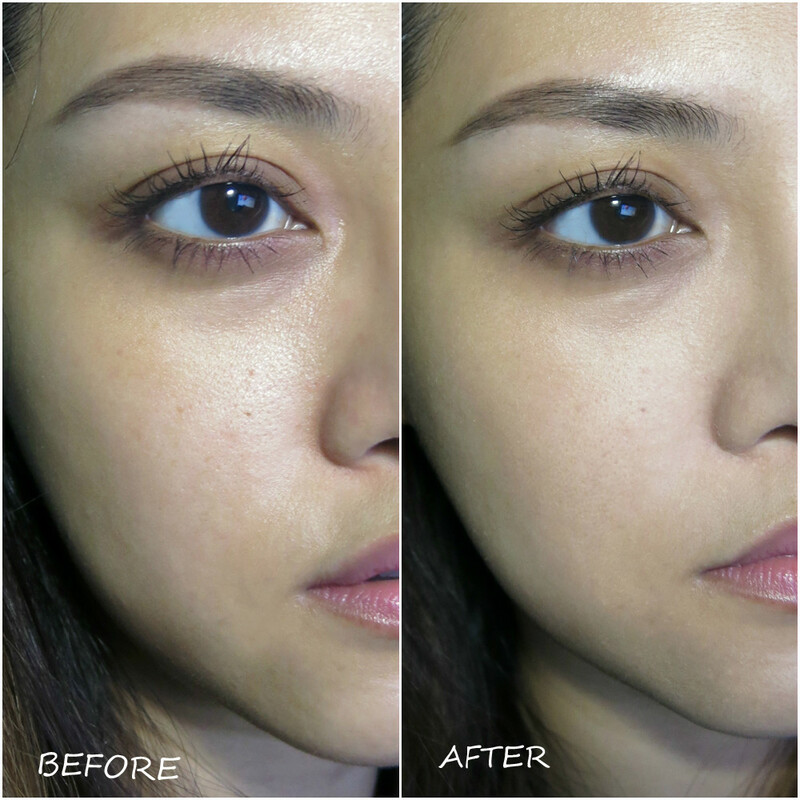 Finally, here's a trick I learnt from Shu Uemura Singapore Trainer Sophia. For that "glowing from within" flush, apply cream or liquid blush to the cheeks, and go over with one more thin layer of Skin:Fit foundation so the blush looks like it is emanating from under your skin. Who do I think this foundation is for? I actually have dry skin and this is quite matte, but it's not overly drying for me either. I would say if you like a light weightless texture, oil-free formula, and pore-blurring shine-control, this is a pretty good option. It contains no waxes and oils or heavy liquid pigments so it will not cause or exacerbate breakouts, although you should be careful if you have any known sensitivities to mint. It doesn't feel tingly or too strong but if you're allergic don't tempt fate. This is NOT the foundation for people with very dry skin. Even with the cosmetic water and perlite to hold water, it's not hydrating enough for dry skins, which often need some waxes and oils to help hold moisture. 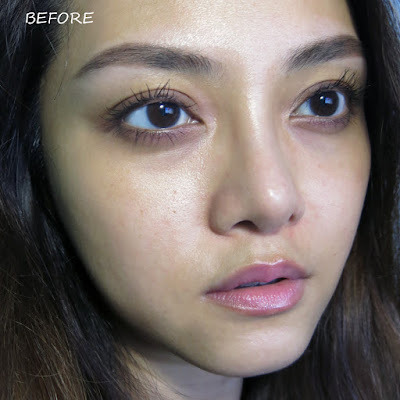 If you like a lot of time to blend and work with your makeup, or you have 10 mins in the morning to do your face, I doubt this is the best option for you too. It takes some time to work the product onto the face in sections and pat it down. If you rush it too much, you could end up with patchiness unless you're extremely skilled at working with this. Shu Uemura's Skin:FIT Cosmetic Water Foundation is out at all Shu counters in Singapore now, and available in 7 of the total 12 shades for SGDS$68. The dual-sided pentagon sponges can be purchased separately in 4-packs for $18 when you need to replace them. What's your lip colour? It's stunning!! That's Shu's Tint in Gelato (Lip & Cheek Cream) in AT02! It's exactly what I used on my cheeks as well. You just reminded me to add that in the post haha. Thanks! I've been obsessed with this lip colour since I saw this post! Do you think the colour AT02 is similar to YSL's Kiss & Blush in No1? Does AT02 stain your lips? Which do you prefer, YSL or Shu Uemura? Thank you so much!!! Yeah it's got a real powder finish. Very different from all the other liquid foundations I've tried so far! What you have described is so accurate. I tried three times and I conclude that this is not an easy foundie to work with. My first attempt gave a masked look as I picked up too much on the sponge. Second time I cut down and ended with pores maximized as I applied layer over layer. I'm still trying perfect my skills using this. Thanks for your review. I was planning to purchase it but with your feedback on the flaw - to becareful when wiping your sweat. I sweat a lot (naturally) plus I teach PE and I am outdoor most of the time. So I guess this product will not be suitable for me. Do you have any recommendation for foundation that it sweat proof? May I know what shade you're wearing? LOL I've just started pack rat removal tucson trying it the last week or so and I have to say I love it! It's not brilliant at curling but it adds quite a lot of length and definition. Screens those who are lack and keeps in mind of the lack requests gotten from other educators. aesoponlinelogin Some areas are resorting to automated systems that utilize the phone. Windows Phone market share is growing, and with expert App Developers Australia (SDI) doing cutting-edge work for https://www.aaatreeserviceny.com/, mobile application development is definitely on the rise. Resetting alternative of Discover Card online account Login to Discover Card Discover Card holders can get several benefits.